For Bayern Munich the trip to Lviv, Ukraine, in February was unknown territory. Perhaps, that may be the reason why they were at odds against Shakhtar Donetsk in the 1st leg clash of the UEFA Champions League. The match ended in a drab 0-0 draw with only one shot at the goal by both teams. Credit also must be given to Shakhtar who are playing under the shadow of a brutal civil war that has caused them to shift their home venue almost 1000 kms away west from Donetsk. Although Bayern would have been happy with an away goal, the German giant do not expect to be troubled much by the Ukrainians in the latter's return trip to Munich. Bayern are still ruling the roost in Bundesliga with a clear 9 point lead over their nearest rivals, Wolfsburg. Champion players like Arjen Robben, Muller and Ribery have been combining brilliantly upfront lately. There is experience in the midfield with the the likes of Xavi Alonso and the very talented David Alaba. Mircea Lucescu, the Shakhtar coach, is doing all he can to keep his players spirits up considering the challenge they face in facing someone like Bayern at home. The fact that the German club will be playing to stay in the tournament will make them a very dangerous and determined opponent. Rarely has a Round of 8 in the Champions Cup gone without featuring the Munich-based club in it. 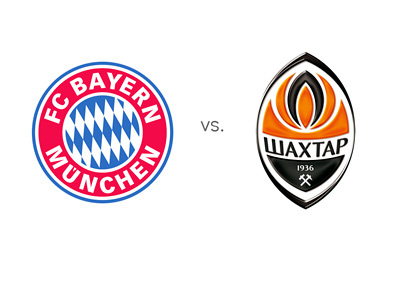 So it will be a shocker of sorts if Shakhtar Donetsk could cause an upset on Wednesday night. In the absence of training facilities in war-torn Ukraine, Shakhtar Donetsk unfortunately had to hold their training sessions in Brazil. Having a host of players from that country dotting their ranks has facilitated such a move.They had practice matches against clubs like Flamengo, Cruzeiro, Atletico Mineiro, Internacional and Porto Alegre thus giving the club a unique kind of exposure. Training in high temperatures of 40C and long flights in-between matches were some of things coach Lucescu introduced in the training regimen. Shakhtar fans back home are hoping this would hold their team in good stead when they go into the March 11 clash. They would badly need their top and experienced Brazilian import, Adriano, to fire. Incidentally he had nine goals from group matches of the Champions League, which is a record for the Championship in that stage. Shakhtar ended their winter break with a 3-0 win over club Vorskla at home. The visitors are expected to start with the same formation that helped them earn a draw in the 1st leg at Lviv. Bayern have not dropped a point at home and have won all their Champions League fixtures at the Allianz Arena beating Man City, Roma and CSKA Moscow. They didn't even concede a goal in any of these matches.They would feel comfortable to put in at least two against Shakhtar and rely on their defense to not let in that vital away goal. Bayern are bound to get a lot of chances to score and it will be up to them to put them away. The Bundesliga champs have scored 23 goals from their last five matches but have conceded a goal each in their last two encounters. The odds are in favour of a 2-0 or 3-1 win for Bayern.